First Eye Care is dedicated to the health and wellness of your eyes. That’s why we offer sports glasses for any kind of professional, college, high school, league and amateur level sports. Play your favorite sport in style with prescription sports eyeglasses from First Eye Care. We’re a leading retailer in DFW of sports frames that are designed for durability, maximum impact protection, comfort, and style. All these elements combine to give you the best corrective eyewear that maximizes functionality and long term use in situations where clear vision may not be the only important factor but is surely one of the factors of performing at your highest level. Our wide range of both prescription and non-prescription sports goggles is diverse, and you can choose from anti-fog SportRX goggles for action sports to RX basketball goggles to play ball indoors and outdoors with the most comfort and protection. We have the other sports like baseball, football and soccer covered too. Whether you’re in the Major League Baseball or a youngster on the soccer field, we have the sports frames for you. Protect your vision from avoidable eye injuries. Goggles and headband glasses should have a soft facial pad and a good ventilation. 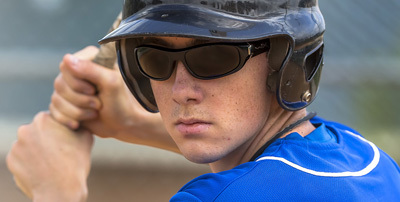 To learn more about our sports glasses and protective eyewear, please visit one of our convenient locations in Downtown Dallas and Irving, Texas.